One of our clients asked us to build several sets of children's furniture. Her children were reaching the age where they needed to have storage space for their things and ample desk space to do their homework. By choosing to have the furniture custom built, the client was able to take advantage of every bit of space in some rooms with small alcoves and angled ceilings. Furthermore, we were able to build the children's furniture in a style that complements the woodwork throughout the rest of the home. The cabinets were made of prefinished birch plywood while all exposed surfaces were made of paint-grade materials. All of the drawer fronts were inset into beaded face frames. Given the traditional detailing of the rest of the house, the beaded face frames blended this cabinetry into the rest of the woodwork. By using crown moldings at the ceilings and running the baseboard trim up to the cabinets, these built-in cabinets look as though they are part of the original house. The client's choice of glass knobs added further to this traditional look. All of the drawers were made of solid wood with dovetail joints and 1/2" thick plywood bottoms. The drawers run on Blum undermount drawer slides with a soft-close feature, except for the vanity drawers and pencil drawers which run on Accuride side mount, self closing slides. These drawers will not fall apart or have their bottoms pop out even after years of use. While the drawers were finished with clear conversion varnish, the exposed surfaces of the cabinets were finished with a pigmented conversion varnish. To ensure that the desktops stand up to years of use, 1/4" thick glass was laid over the desk top space. 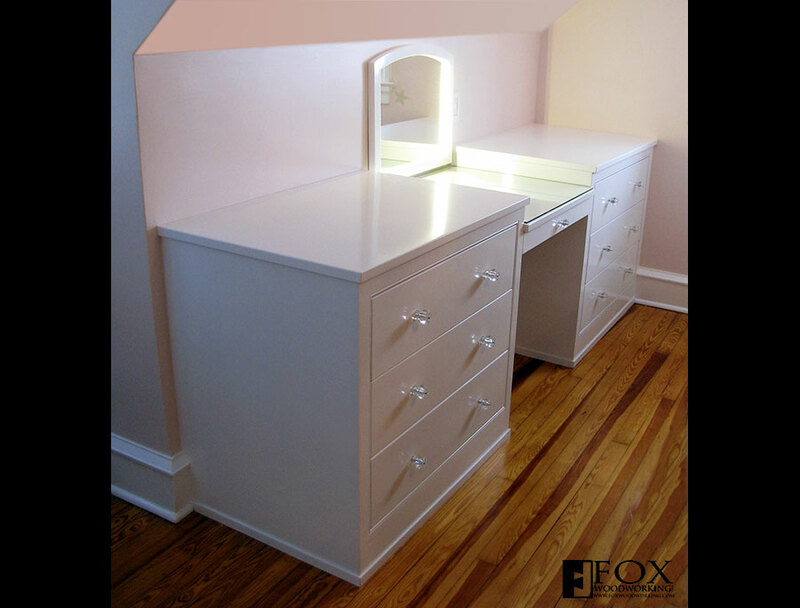 In the photo below, you can see that we also provided 1/4" glass for the small vanity desk section of the girls' furniture. In addition, the mirror was lighted with dimmable LED lights. 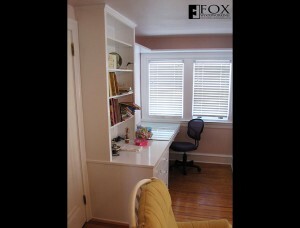 To see more photographs of built-ins, please click here.